This week, I wanted to highlight a brand that many people have heard of, but not necessarily in the context of flutes: Pearl! “But wait, doesn’t Pearl make drums?” is a question that I hear so often when people come into the shop–and the answer is yes! Pearl is very well-known for their fantastic percussion sets and drum kits, but they also make a wide range of wonderful flutes as well! Pearl Musical Instrument Company was founded in 1946, and the company began making flutes in Chiba, Japan in 1968. Their instruments range from high-quality student flutes, which feature a solid silver lip plate riser. This feature differentiates them from most student flutes which are fully plated, to handmade professional instruments in a range of high level materials such as 18k gold and platinum. 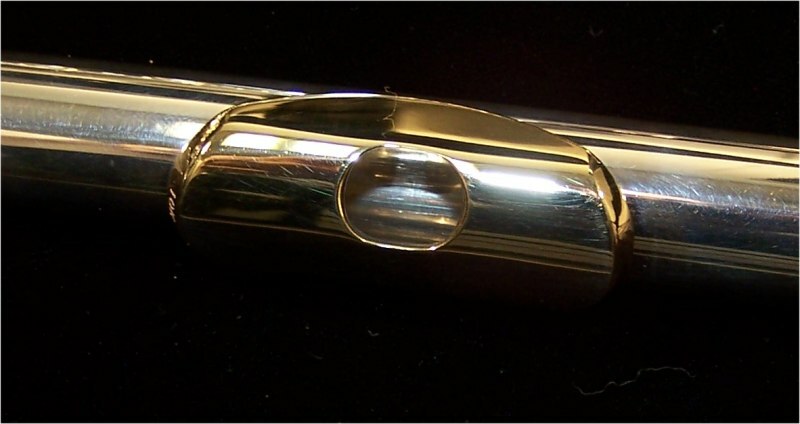 Pearl flutes are also set apart from many other manufacturers in that their mechanisms are pinless. This setup is unique because instead of the tiny pins that hold together the crucial pieces of many flutes–which can snag and catch–the rods and tenons are instead held together by a series of small screws. This both affects the durability of the instrument and creates a smooth, highly effective action that many players enjoy. Finally, Pearl includes French pointed key arms as an added feature. These features are included even on intermediate instruments. 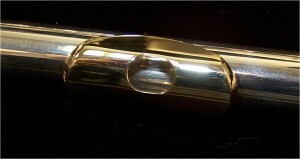 Pearl flutes tend to have a very unique sound, one that does not fall neatly in with either the dark, rich American sound or the bright, responsive Japanese tendencies. One of the reasons for this is the unique cuts and features of their headjoints, the most popular of which is the Forza cut. This headjoint, as shown below, has a very sharp, angular drop-off on the side of the lip plate, which makes for a very unique sound quality with just a bit of resistance. Erin currently has a few flutes available with this headjoint, as well as an amazing fully handmade professional-level Pearl, so come check them out!